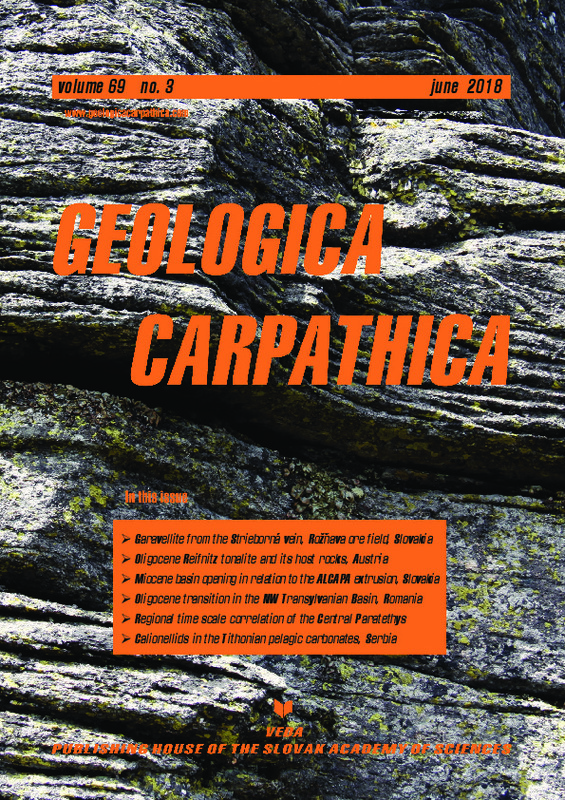 Abstract: In the south-eastern Eastern Alps, the Reifnitz tonalite intruded into the Austroalpine metamorphic basement of the Wörthersee half-window exposed north of the Sarmatian–Pliocene flexural Klagenfurt basin. The Reifnitz tonalite is dated for the first time, and yields a laser ICP-MS U–Pb zircon age of 30.72 ± 0.30 Ma. The (U–Th–Sm)/He apatite age of the tonalite is 27.6 ± 1.8 Ma implying rapid Late Oligocene cooling of the tonalite to ca. 60 °C. The Reifnitz tonalite intruded into a retrogressed amphibolite-grade metamorphic basement with a metamorphic overprint of Cretaceous age (40Ar/39Ar white mica plateau age of 90.7 ± 1.6 Ma). This fact indicates that pervasive Alpine metamorphism of Cretaceous age extends southwards almost up to the Periadriatic fault. Based on the exhumation and erosion history of the Reifnitz tonalite and the hosting Wörthersee half window formed by the Wörthersee anticline, the age of gentle folding of Austroalpine units in the south-eastern part of the Eastern Alps is likely of Oligocene age. North of the Wörthersee antiform, Upper Cretaceous–Eocene, Oligocene and Miocene sedimentary rocks of the Krappfeld basin are preserved in a gentle synform, suggesting that the top of the Krappfeld basin has always been near the Earth’s surface since the Late Cretaceous. The new data imply, therefore, that the Reifnitz tonalite is part of a post-30 Ma antiform, which was likely exhumed, uplifted and eroded in two steps. In the first step, which is dated to ca. 31–27 Ma, rapid cooling to ca. 60 °C and exhumation occurred in an E–W trending antiform, which formed as a result of a regional N–S compression. In the second step of the Sarmatian–Pliocene age a final exhumation occurred in the peripheral bulge in response to the lithospheric flexure in front of the overriding North Karawanken thrust sheet. The Klagenfurt basin developed as a flexural basin at the northern front of the North Karawanken, which represent a transpressive thrust sheet of a positive flower structure related to the final activity along the Periadriatic fault. In the Eastern Alps, on a large scale, the distribution of Periadriatic plutons and volcanics seems to monitor a northward or eastward shift of magmatic activity, with the main phase of intrusions ca. 30 Ma at the fault itself.